Game attribute list are still going to be a problem. I'm just going to have to add a ton of game attributes to a list ( I have 80 , don't ask). Since they are already created within a category, it might just be better to just make action blocks based on the category. I know I should've went with list from the begging. But the game I'm working on is very, very complex and list will just create contradiction in conditions within the code, resulting with Stencyl just throwing back errors. It would just be easier to have game attribute_category blocks. Should I leave the request for a extension in this topic? Or it would make more sense to move it to the issue tracker ( for the block to just be added through a update..) ? It would just be easier to have game attribute_category blocks. 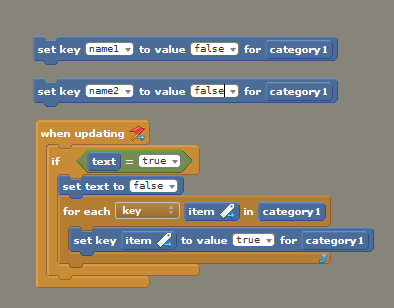 "Attribute_category blocks" is the same as array. If you do not want to use list and numbers, try using a array extension.